I have it on good authority if you serve these during a football game, your team will win. I’m collecting data and that’s absolutely true. . . . so far. Conduct your own test and see. In fact, the guys are so sold on this winning thing that they are willing to watch any game, no matter who is playing, and draw straws to determine “their” team, just to test the theory. Me – I ignore the game and concentrate on my project du jour while munching from the plate of pinwheels at my side – win, win! There are never any leftovers whenever these are served and that’s certainly a winner! Use crescent sheets if your store has them. No perforations to come apart. You can use any deli sliced meat you like instead of ham and your choice of cheese. Just choose finely shredded cheese as it will stay in the roll better than the thicker shreds. If you are afraid of harming the no stick finish on your cookie sheet with a sharp knife, make the roll on a cutting board. Place the cutting board close to or on the cookie sheet so the smallest distance possible is needed to move the cut pinwheel. Check the pinwheels when they’ve baked for 10 minutes to see if they are done. Watch carefully for any additional time so that they don’t overbake. 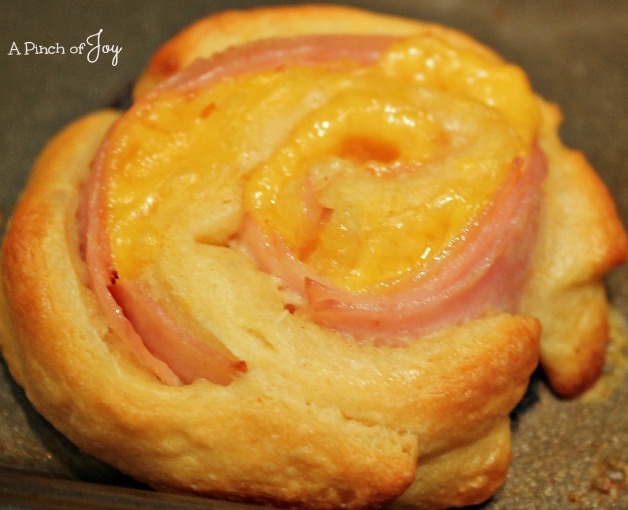 Hot ham, creamy cheese, wrapped in mustard tinged light, fluffy and flaky goodness . . . mmmm! Unroll crescent dough onto cookie sheet and, if using rolls, press the perforations together to seal. Flatten and slightly spread dough. In small bowl, mix mayonnaise and mustard, then spread evenly over the dough. Layer ham evenly across the dough. Sprinkle cheese evenly over the top. Beginning with the longest edge, roll the dough and filling into a log. Slice with sharp knife into half inch slices. Place slices on cookie sheet about an inch and a half apart. Bake for 10 – 14 minutes or until golden brown. Remove from oven and let cool until pinwheels can be handled safely. 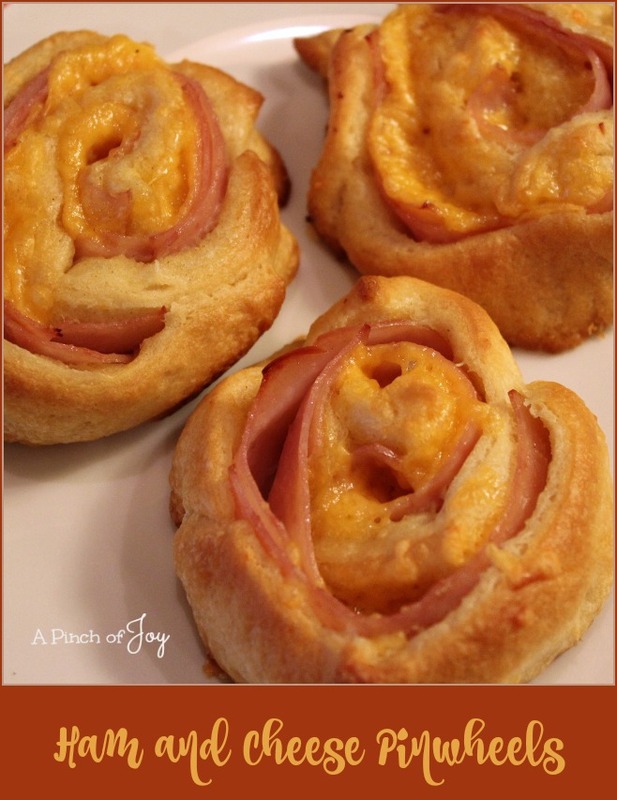 Your Ham and Cheese Pinwheels look delicious! Hope you are having a great day and thanks so much for sharing with Full Plate Thursday. These look DELICIOUS! I’ve used crescent rolls to make sweet rolls before, but I’ve never used them to make something savory. I’m going to try this! Thanks so much for joining Grace at Home at Imparting Grace. I’m featuring you this week!